My freedom is inherently linked to yours. As long as your are still bound by the chains of unseen oppression, and are wandering the fogs of illusion, I will remain here. At best, I can consider myself a recovering egomaniac living within a patriarchal society. Over the years I have directed my efforts towards the healing and repairing of the many beautiful relationships within my life. The Loving familia that I have, my amazing friends and my distinguished colleagues– jugglers, musicians, authors, historians and carpenters have all contributed (in one way or another) to the dismantling of my ego and have helped reconnect me to my and Divine Masculine self– special thanks to the men who raised me, my uncles, father, grandfather and cousins. From an early age I have been witness to various levels of urban violence, domestic abuse and have witnessed one too many car crashes. My intention in writing, and in reading about the past in texts such as Mary Wolfstonecraft’s A Vindication on the Rights of Women; Arthur Miller’s The Crucible or even Octavia Butler’s The Parable of The Sower the struggles, challenges and triumphs of the yesterday have been highlighted. In short, we are learning and growing from our previous experiences. 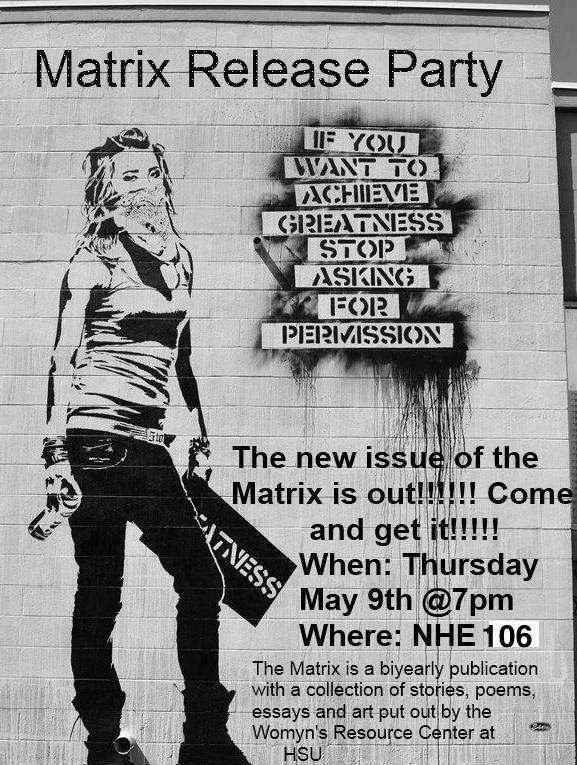 The Women’s Resource Center sponsors the publication of a feminist magazine called The Matrix. This publication serves as a forum for the expression of feminist ideas, and contains poetry, fiction, news, politics and art. The Matrix has been recognized as one of the top college publications by The Nation magazine, and has loyal readers all over the country. Non-Arcata residents can get a free subscription by emailing hsuwomen@humboldt.edu with their address. The Editor for editon of “The Matrix” was Amanda Saiz and she held the publication release 27 November 2012 in Nelson Hall East, Arcata, California. Digital editions of the the Fall 2012 and Spring 2013 editions can be located here. Published in The Matrix Fall 2012.
a beauteous resolution is sprouted with a single seed. as we interconnect like the neo-dreamers of Zion. We sing, we sing, we sing. “I am strength, wisdom and courage. And finding common ground in the urban beat. Brick by brick if we must. We Chalk for those we Love. Yes, it is up to us to build trust and see new horizons. and greatness is what we be. mindful of the trees, birds, and the azurite sea. The breath of inspiration is in our lungs like argon. waiting for the days of free flight. And build a road that extends beyond the sea. Embrace with open heart, body and mind. Be Love and take the time for one another. Listen to the wind, it is our voice. Be fearless, courageous and loving. My Brothas’ and Sistahs, we are a community.